Not every job requires all the bells and whistles. But every job does deserve the best. The MCV-AII is designed to provide top quality double-column machining at an affordable price. With an easily operated vertical quill and available simple 5-Face Machining, the MCV-AII is the perfect solution for powerful cutting on medium and large size parts. And thanks to our hybrid guides, the load limit increases tremendously without compromising stability. The result is a simple yet robust machine that is built to last. 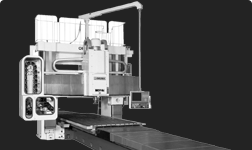 Flexible and durable double column machining center for medium- to large-size parts.